So how did I get on with last weeks list? 5. Print out and read But Not Forgotten extract (Faber sub) and take to West Dean for editing/fiddling.Done! So now, for this weeks lists…..ooooo, it’s a busy one! 2. Keep up with Nano word count – try to get ahead a bit more. 4. Finish Richard Skinners book. 5. Print out and read Faber Guest Tutor stuff – FOR MONDAY! This entry was tagged Don Delillo, Faber, Goals, Nano, To Do List, Word count, Writer, Writer Resources, Writers Resources, Writing, Writing Goals. Bookmark the permalink. Just keeping up with the NaNo word count is an accomplishment. You’ve gotten quite a bit done!! 😀 I finally finished the preliminary edit of a manuscript. Waiting to see what the beta reader catches before I send it to the editor. Have a great week Vikki! I’m really having a hard time with the word count Melanie, probably because I’m so blooming busy lol. Good luck with your Beta readers honey. 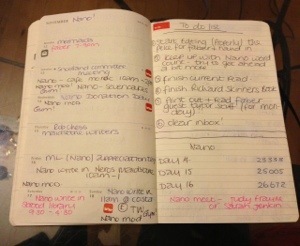 my goal is just to catch up with the word count for NaNo. Good luck honey, how far behind are you? Trust me, I’m beginning to waver! Has it been 8 weeks? Bloody hell 😦 Fingers still crossed for you though honey. What a great week and a great list for this week, go you! Wow, you sound pretty busy too honey! I just want to not be behind on my word count for NaNo. I want to try and catch up and get to 25 000 by halfway day. I’m writing with my fingers crossed. Good luck Rachel, what’s your word count now honey? Ha ha ha, it sure does take over doesn’t it!